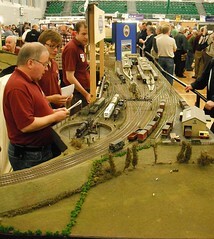 At Railex, there were several layouts displayed in what we call "letterbox" format. That is, the model is completely surrounded by a fascia above, curtain below and sometimes "wings" at the side. The idea is to focus the viewers attention on the model itself by cutting out all extraneous visual distractions. On the plus side, these do seem to showcase the modelling well. On the other hand they can block the operators from the view of the public. This might not be a bad thing in the case of some people (never mind having a face for radio, some of us have a face for hiding behind several feet of plywood) but can also inhibit the chat that for me is so important. Some layouts get around this by placing the operator at the front. While he is then available to answer questions, he also has to get in the way of the audience if anything needs to be carried out on the layout such as re-railing rolling stock. 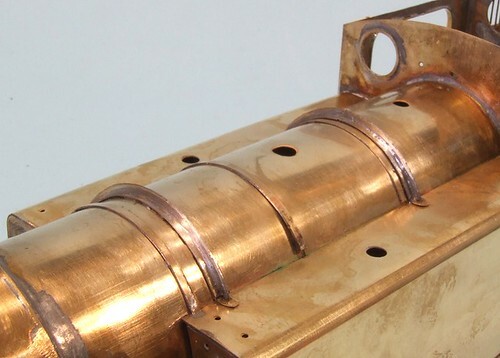 From a practical point of view, it would make sighting magnets for auto couplings impossible (you need to do this from above) and puts things like control panels and mugs of tea on display. We tried this with the Hellingly Hosptial Railway and I think it looks very nice. However, Melbridge Dock & Flockburgh are more conventional with the scene in front of the viewer, high fascias and the operators easily visible. Backscenes help to stop the view being ruined by railway modeller tummies but obviously there are more distractions for the viewer. So, what works best ? As a visitor to the show, do you like letterbox layouts or not ? I ask because at present Foxdale is planned to be displayed this way but if enough people aren't happy then perhaps we'll change out minds. Railway modelling is supposed to be a solitary sport. The stereotypical modeller has no friends and sits on his (always his) own in a lonely room fiddling with toy trains. Occasionally he will put aside his tools to nip out and murder someone (copyright every TV detective drama ever made) but generally, all human contact will be avoided. I know this because I went to Railex on Sunday and talked to an awful lot of people, none of them murderers to my knowledge. A shift change at work made the Sunday more appealing than the Saturday for a visit. This meant I'd have to eshew the nice train ride for a run down the motorway but on the plus side I knew the crowds would be significantly smaller and so the chance of conversing with people a lot greater. Arriving about half an hour before the show opened we parked up very near the door and wandered in. Tickets could be bought in advance and after this we grabbed a cup of tea. The prices and quality of refreshments were the first surprise. 2 teas and 2 shortbreads were just 4 quid. That's good going anywhere but in a leisure centre counts as a minor miracle. 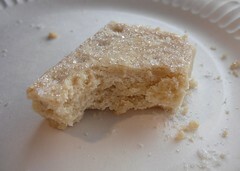 Better still, the shortbread was absolutely excellent. Mind you, the breakfasts on offer looked very tempting too. As a test we did try 2 more teas and food and found them all very good. Inside, as expected, we were able to walk in comfortably and start to work around the hall. Sensibly, the quarter-circular East Dean was just inside the door allowing for a big lobby area to give people room to mill about and meet up by the entrance. The first purchase was made from Wizard models where I picked up some couplings to be used on the Isle of Man project. And so it went on. In full-on magazine writing mode, I'm always on the lookout for possible projects to build and then write up and several of these were spotted. Eileen's Emporium helped me re-stock on a few bits I'd used from my stash of detailing parts. At this point in the day they were happy to chat too and so I learn that they have been supplying long lengths of wire to the Notting Hill Carnival for headdresses. Apparently the organisers found them via a web search which proves the benefit of the excellent website. A brief mention has to be made of various DOGA members who I bumped in to around the hall. Brian was behind Borchester Market, which like Wagons Wheels is smaller than I remember it. The operating team were grasping wads of paper which apparently hold the sequence. It all looked a bit daunting to me but obviously worked as even first thing on a Sunday, there was plenty of movement. By GW Models, Christopher had very sensibly brought a shopping list. I wish I'd thought of that as I wouldn't have forgotten to pick up some wire snips to replace my battered ones on the workbench. Trade, as ever, was excellent and I could have spend many times what I managed to do. Now at this point I should probably reel off a list of the new goodies I saw, but some of these are secret because they came back in my bag and others aren't available yet, including several resin lowmac type wagons. To be honest, this is the wrong time of year for new releases anyway, instead people were stocking up for the quiet show season. Railex is the last hurrah for serious modeller type shopping. You don't see a collection of bits'n'pieces trade like this until the autumn now. On the layout front, well I liked Mr N's Combwich, especially the new Planet loco and Thomas poking out of the shed. For the later he will be forever cast out of the finescale world of course. The Nettlebridge Valley Railway impressed me. Deep baseboards allow for a much more impressive scene than you normally see. Setting the model back in 1910 adds extra interest, in fact the model looked just like photos I've seen of early railways. This is definitely not the same as later lines but in a way I can't quite define. My favorite loco of the show has to be the 4mm scale narrow gauge Garratt on Ddualit. How so many waggly bits and operate in such a small scale so well is a mystery to me. At one point it shared the layout with a Double-Fairlie as well. Articulated heaven ! After 6 hours we left talked out and happy. Saunday is obviously the day to go if you want to see the show properly. The first day, the crowds had apparently been chocca. Next year - we'll be doing this again. Unless you are really desperate for the latest bargains, it's the future of exhibition attendance. 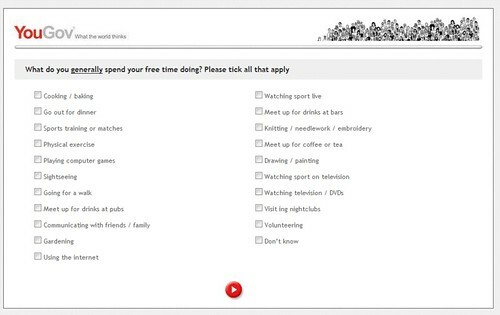 Like many people online, I'm signed up with YouGov, the survey organisation that regularly turns up in the news. We take part in the surveys partly to help form policy and better inform those in power but mostly because we might get enough points by filling the things in to get a little bit of money. Anyway, here is a recent survey question. They want to know how I spend my free time. Sadly I can draw of paint, visit pubs or bars, even try embroidery but is there a tick box for "play trains" or "engage in finescale model making" ? No. There also aren't options for boat building of fixing aged automobiles. In fact the list of options is laughable. And that dear reader is why we get so little representation. Government simply doesn't know we exist. I say it is time for us to rise up from our workbenches, gather the sharper tools in our collections, and march on Parliament ! The one that should have a propeller on the end of it ? Yes, that is why I had to retire from the Club 500 racing at the first event of the year. I was going well in the second heat and suddenly nothing. The boat drifted to the side and wouldn't re-start. A fellow member who was digging his model out of the bank shouted over that it was making a noise but not moving. I picked it up and looked underneath expecting to see weed around the prop. Seeing no prop at all sealed a rubbish day. In the first heat I managed a whole lap, then there was a bump with another boat (racing incident, no need for the stewards to get involved, honest) and the thing stopped moving. A stiff breeze returned the boat to the side and with it back on the bench I found that the motor had moved back in the collision and lost its grip on the propshaft coupling. A matter of seconds to fix, but no useful laps on the board. Before this I did manage to finish a race with the Slingshot. OK, so I was off the pace by a long way, 2 laps down on the leader at the end of 4 minutes, but I finished. Race 2 comes along and I decide to use my new battery. That will give the boat some grunt. It did bu since I'd forgotten to glue some Velcro to it, the heaviest item in the boat wasn't fixed down and slid all over the place. It didn't seem worth putting it on the water to be honest. At least that way it wouldn't sink. Sometimes you have to be happy to take the boat home. A couple of months ago, ModelRail asked for more information on the snakes that operate points on the Hellingly Hospital Railway layout. I took an old article I wrote on the subject for the Double O Guage Association and thought I could just re-vamp it a little and send it in. As it was, once I started I ended up re-writing the piece and even tweaking the diagram and photos. The results can be seen in the Q&A section. I'm even listed as a "Guest Expert" ! Planning proper has now begun on Foxdale. When the Parker's build layouts, that means taking some point plans and scattering these over the board until we like what we see. 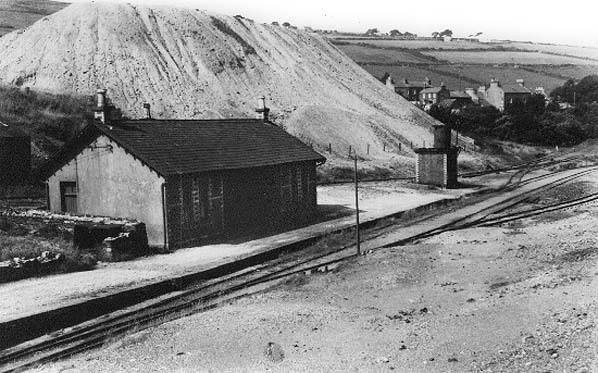 The station features and interesting bit of pointwork with four turnouts facing each other to preform the same role as a double-slip would do on a main line model. It's this that really got us interested in the station. To aid construction, the plans for this central section have been laid out and stuck to a sheet of paper. This is them plonked on the board to give us something to work around. 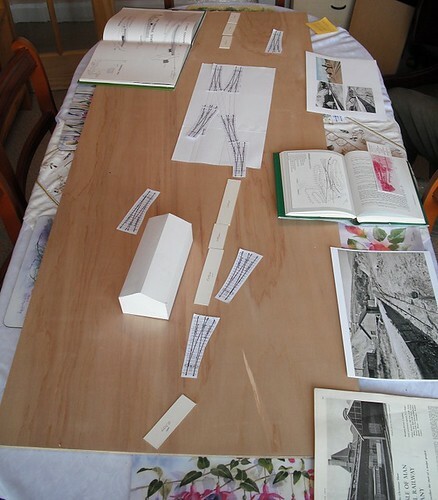 Other aids to planning are the flat stock mentioned on Tuesday, and a mock-up of the station building. It's the only one we have a plan for and since there are only three structures on the model, we had better get it right. The photo also shows a couple of plans from books that only slightly contradict each other and every photo I could find on the web. From all this we have worked out that it is possible to build the model in the space available. This is determined by the size of board that will fit in the back of the Berlingo without splitting the model into several boards. The overall plan is for a letterbox style model with integral lighting. It's not going to be perfect, the length will be condensed to get it to fit, but we are looking for a pleasing representation. Go somewhere else if you want a perfect model. One happy surprise is that this will be an interesting model to operate. Sidings pointing in both directions proliferate, not something you find elsewhere on the Isle of Man. Despite out condensing, sensible trains can operate - choosing the Manx Northern helps a lot in this respect as the longest passenger service is likely to be the railcars which as two units with a van in the middle. 2 coach trains or 4 wagon freights will be OK and possibly a little longer once we get building. Some work will be required on ground contours. There is a huge pile of rubble at the back and the line to the mines needs to rise up by a centimetre or more. That doesn't sound too scary through so things are looking good. Stay tuned for more updates as they say ! A couple of years ago, I had an idea for a folding baseboard. At the time I thought I was being innovative and expected that exhibitions up and down the country would be full of model railways making use of what would be called "The Parker Baseboard". Licencing deals would be struck so that the design could be produced commercially. I would become a millionaire and retire to a giant yacht somewhere sunny where I would spend my days reclining and drinking cocktails. I think the design was passed on by a few people including one chap who told me he was sending it to a friend who was an "expert" on benchwork (American term for baseboards) who would pronounce on my design. I can't remember if I ever received the judgement but needless to say I still think the design has merits and one day will have a go at making it up in real wood. Anyway, while looking through my boxfiles of old model railway magazine articles, I found this drawing by non other than Cyril Freezer. It dates from March 1981 and apart from the lack of a front cover and fascia, it's pretty much identical. He even managed to attach the fiddle yard which I didn't bother to do. 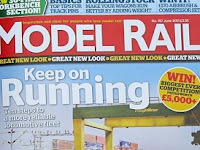 I don't remember seeing this article in Railway Modeller magazine, although I must have to cut it out of the issue to store it away safely. Needless to say if I now become phenomenally wealthy through the marketing of my design, Cyril's son, Nick, will be chasing me for half a floating gin palace. 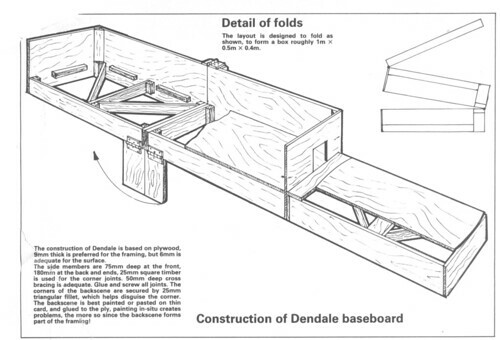 If we are to plan out Foxdale we need some rolling stock to work out siding and look lengths. Of course I haven't actually got around to building very much yet, specifically one van and half a loco, so either it's late nights on the workbench or improvise. Thus we have the ultimate "flat pack" rolling stock for a model railway - rectangles of Daler Board with writing on them. These can be pushed around and placed on the plan as required. If a wagon falls on the floor, there isn't much detail to damage and even storage is simple. You could suggest that we might as well have made the stock to scale rather than full size but with a little layout and a full size board already available there's not much to be gained. Anyway, I find it easier to work out what's going on at 1:1 scale. I can't claim this to be an original idea. 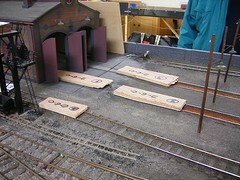 The same technique was used by the L&WMRS 7mm scale layout "Kimble" when they re-planned the engine shed area. Lobbing O gauge locos around while planning isn't exactly popular with their owners and so some lumps of plywood acted as stunt doubles. Now this might just be a planning idea, but does it have to be so ? After all there is the Pokemon craze where eager youths pay stupid sums of money for cards representing the characters they desire. Why bother with 3D locos when the model railway industry could just sell special approved cards ? Just think, no more problems with ham-fisted modellers getting the things out of the box. No storage issues. The locomotives can be displayed in an attractive picture frame. Since many real models never see a track because they are part of a "collection" then the no-working nature of the cards won't be an issue. You can even have proper arguments over prototype fidelity. Can a colour photo really represent a loco that only existed in the days of black & white film ? Since I last mentioned the Class 26 model, it's received some transfers, a coat of matt varnish and a little bit of weathering. After a Krystal-Klear glazing session, the loco is ready to appear on the layout. In the flesh it looks pretty good to me. I've learnt a lot by building it and generally enjoyed myself. At least I can say that there won't be many others out there that are exactly the same ! Use "Rail White" rather than normal white as it's less stark. The wash of track colour seems to have calmed it down a bit but the correct colour would have been better. 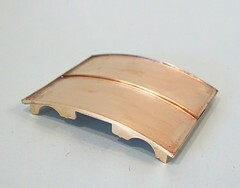 Try and make the bogies narrower so the brackets that should dangle from the chassis outside of them could be modelled. Lower the chassis by a millimetre or two. The "design" would require significant modification for me to do this now. The nuts are under the footplate and don't allow enough headroom to lift the bogies up. Mind you, this isn't nearly so obvious from normal viewing angles. Put some handrails on ? I left them off because they are flush with the sides and without a milling machine making a neat slot for them would be nigh on impossible. Perhaps a line from the bow-pen in silver ? For all its faults, this model locomotive has turned out OK and will hopefully become a stalwart of the Flockburgh operating fleet. And it's another box out of the pile ! When I come to power, something that can only be a matter of time, there will be some changes around here. "Start making No. 170 again. And call it track colour." If there is one colour I use from the enamel paint range it is this. More than black or white or even 147 Pale Grey which I like a lot. Why this was ever dropped from the range is a mystery to me. 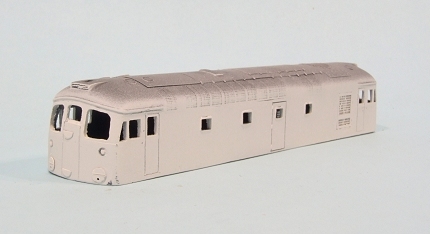 I probably buy enough to justify it, never mind all those other modellers who should be doing the same. Nearly everything on my layout get a misting with the stuff because it's quite simply the colour everything on the railways ends up if it isn't cleaned. Precision do a nice underframe dirt which is the same colour and now I will have to use that since my two remaining tins of 170 have dried up. I do posses a tinlet of genuine "Track colour" but I don't like to use it in the same way you don't like to drink a very, very rare wine. 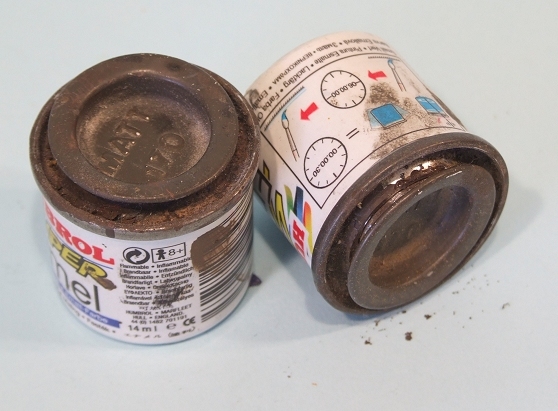 It is so old it even smells different to the modern paints and is probably quite deadly. So, to all those at Humbrol towers, when you see me processing up the Mall, get with of the Beemers and starting making brown. Sometimes I see a model someone has made and it blows me away. A couple of weeks ago I went over to Bilton near Rugby for the Slim Gauge Society meeting and on the Phoenix Narrow Gauge modellers demo table, among some of the best railway modelling I've ever seen, was Project X. 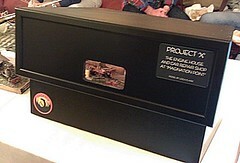 As you can see, Project X is a box. With a hole in the front. 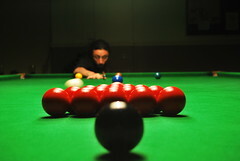 The viewer sits on a chair and peers into the hole. Inside he or she finds themselves inside an American locomotive shed. 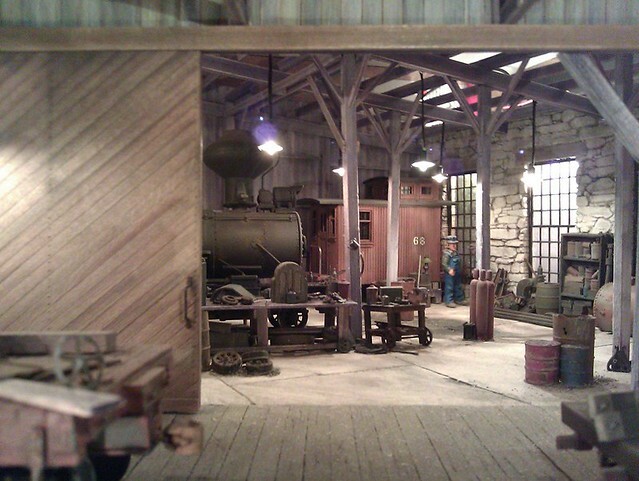 In one corner there is a steam engine but most of the scene is taken up with the accouterments of locomotive maintenance. The level of detail is awesome. The staging is even better though. You can't see all the model when you look through the hole at first. You have to look around and there are things blocking your view - just as there would be in real life. Of course I now want to build something similar. That's a pain as I have so many other projects on the go. Maybe one day. The model is an extreme version of the theatrical staging that Iain Rice bangs on about in some of this books. You take control of the viewpoint just like a stage. Hiding things behind walls and other blockers gives the model an air of mystery. I wouldn't want to see an entire layout like this, although the idea of putting a small camera in a building to show the view out of a window has crossed my mind, but it's a great way to display a diorama. Note: I'd left my camera in the car and so these photos were taken on my 'phone, a HTC Desire Z. The top one is a bit wobbly as I just snapped it, but the close-up is suprisingly good isn't it ? 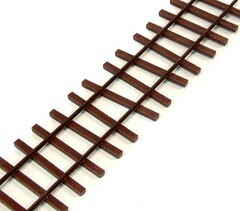 A few days ago I purchased some very nice On30 flexi-track from EDM Models. It look great with code 70 rail (you can have code 83 or 100 as well) and nice fine sleepers. 18ft of it, probably enough plain track for the entire layout, costs just over 30 quid which isn't unreasonable for a specialist product. I know the same thing can be made from nickel silver rail and copper-clad sleepers but it's deadly dull to make and probably not that much cheaper. Interestingly (well I found it thus, which probably says something about me) is that the rail itself comes from Sheffield. This is then shipped to the USA, sleepers are attached and then sent back to blighty. In fact it appears that pretty much all model railway rail comes from Sheffield where it is made by one man. I'd assume that Marcway (based in Sheffield) us him. Kalgarin do for their new range as well. Worryingly, he's approaching retirement age so maybe I should stockpile the stuff ? Anyway, once the track has come back from the new world, it has a sticker on it. 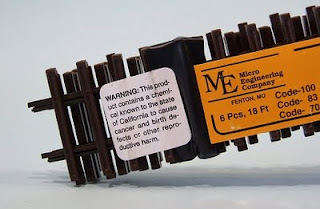 Apparently if you use this stuff in California, the track can cause infertility and birth defects. Presumably you could be born a Great Western modeller. Which would be pretty bad. An old friend from the National Railway Museum came to me with a request. 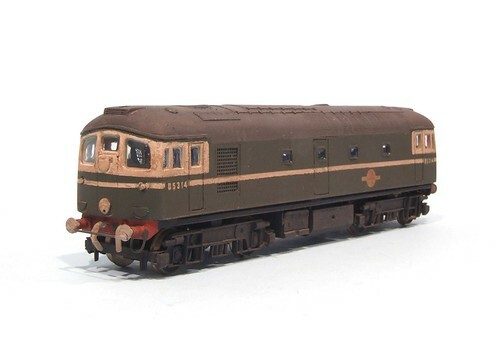 Could I renumber a Hornby 2P Locomotive ? 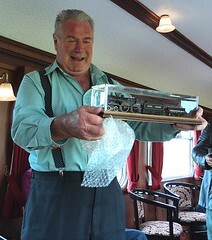 The model engine in question was to be presented to Ray Towell, the Rail Operations Manager at the museum during his retirement event. 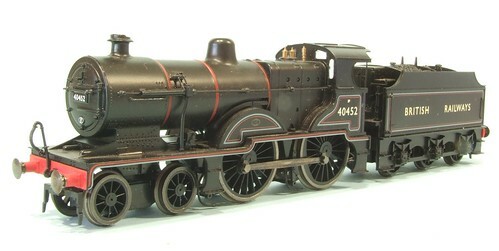 The number chosen was 40452, the first engine Ray had ridden on as a small boy. The model was delivered to me and I started by rubbing the old numbers away using a cotton bud dipped in methelated spirits. With care I only managed to remove a tiny bit of lining but it took a fair bit of work. 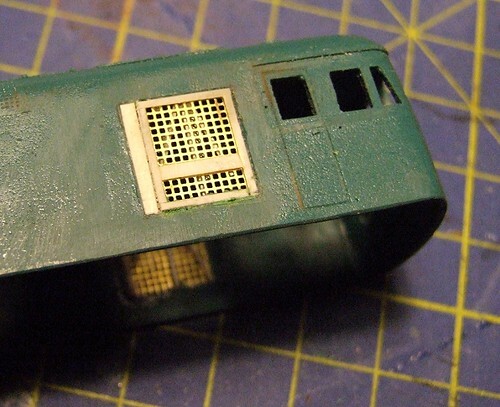 Then replacement numbers were chopped from a set of ModelMasters waterslide transfers and placed carefully on the cabside and smokebox door. Ideally I'd have gone for Fox ones but didn't have any to hand at the time. The model is destined to live in a display case so no varnishing was undertaken. Not something I'd risk if I expected the locomotive to be handled. What I didn't realise until I got my hands on the thing was just how bad a model this is. If you look at the reversing lever, it goes through the boiler in an enormous gash ! How did that happen when they were designing the thing ? Anyway, whatever my misgivings, the loco certainly seemed to go down well with it's recipient. It's nice to make people happy with your model making ! Three goes. Two failed attempts to form these b****y things ! Normally I bend the wire for the front handrails around a convenient pot but nothing to hand seemed to be right. Working with just fingers resulted in a 20p piece shaped bit of rod - several straight bits joined by sharp corners. In the end I used my rolling bars. Not easy because the stupid wire kept wanting to lie at 90 degrees to the way I wanted it. Even getting the last piece right took many attempts and much frustration.. The some bends to get around the boiler and I slipped the split pins that act as handrail knobs in place. Everything was tack soldered in place and then adjusted again and again until I was happy. One hint, when read for the final fix, plenty of flux and a small gas flame make for a reasonably neat job which doesn't need much cleaning up. An old lolly stick can be converted to a handy spacer to keep them all out the same distance from the body too. With the big lumps of the C15 together, it's time to start detailing this model locomotive. For no particularly good reason, I started at the cab door. The beading around the edge is supplied as 4 strips (2 for each side) which have a half-etched line along the middle. Simply line up the groove with the side of the opening, tack it in place and pus the metal around the inside of the hole. I never bother with too much pre-forming, preferring a tiny bit of brute force to shove the metal where it is supposed to go. This works most of the time, especially on larger models. Solder inside the cab as you go and it will be fine. On smaller stuff I'm normally tempted to leave beading off as being too fiddly to bother with. 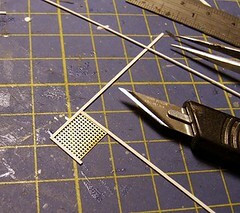 Maybe 4mm models justify it but in 3mm - well the etched parts are usually too small to use properly. If it's straight, fuse wire works well but to be honest, do it wrong and it looks rubbish. Better to ignore it for an easy life. 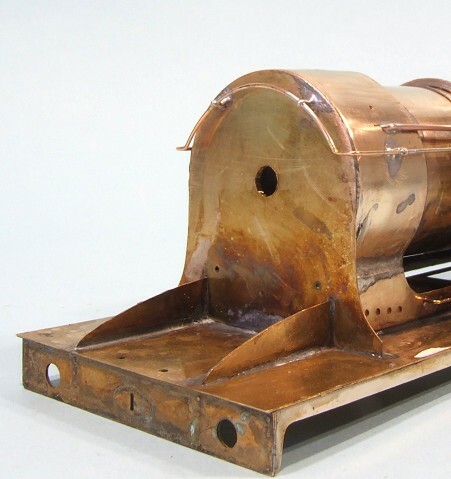 Boiler bands on model locomotives - a good or a bad thing ? In real life they are impossibly thing and many prefer to represent them with sticky tape or even a good coat of paint. Kitmakers like to give you some etched strip though, even if it is nearly as thick as the prototype. The C15 kit has bands and half etched grooves to fix them in to. Normally I struggle to fit them neatly but that's because I'm too lazy to get out the Resistance Soldering Unit (RSU). When I do, remembering to tin the back of the bands, fitting is a breeze. Slosh the flux around and spot the metal in place with the probes. The heat is localised so I don't have to heat the entire boiler up just to get the solder running on the back of the strip. So tidy is this methods that I was able to fix that band shown lifting in the photo but not spotted by me until I looked at the picture without having to spend more time burnishing excess solder way, just wiping a bit of flux off the top. The braces work in the same way. For some reason the didn't fit the boiler properly, being well clear at the top at first. I looped them in half with a piercing saw, filed a bit out of the middle and then soldered them in place, again with the RSU. A bit of fettling and you can't see the join. 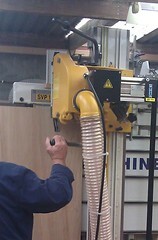 What you see in the photo might look like a big machine cutting a piece of plywood. What it really is, is the birth of a new model railway. After years of prevarication, we've started work on the long promised Isle of Man layout. I'm not quite sure how this happened, one day my Dad fancied making some track and I needed to persuade him away from a main line station. For a while now I've been wondering about picking Foxdale as a prototype and when we sat down and did a little research, it seemed to fit the bill. Firstly, there mustn't be too many coaches. I hate building them and the kits cost a fortune. Luckily there is "The Foxdale Coach". One vehicle, even I can enjoy making that. Apart from this, trains on the Manx Northern were short - no Douglas style 12 vehicle trains with a loc on each end. Next, there is shunting. Wagons go in and out of the mines over the most interesting track formation on the island. It's not a pretty station, surrounded as it is by spoil tips, but then we like industrial settings. Anyway, if we bend history a little and model it in the very early 1960's, plenty of vegetation will be present. It's not too much of a stretch anyway as the last train ran in 1961 as far as I can tell and the track lasted another 10 year. So, that's a new project (note I didn't say THE). It should be a quickie but no doubt progress will be in fits and starts. I don't know when it will be finished but we'll probably book it into a show or two before its ready and then have to rush to get things done. So far we have a 5ft by 2ft baseboard. And half a plan. Anyway, for those who don't know the prototype, visit this website. If your copy of Hornby Mag has arrived with a thump through the letterbox then tear off the plastic bag and inside you'd find that Parker's Guide is back to rolling stock construction. This time it's the Chivers ex-LMS "Long Low" kit. We've been talking about doing a steel plate wagon for some time but I wanted to avoid yet another Parkside kit. There have been lots of these and it's important to prove there are other kit manufacturers out there. Anyway, the flat wagons in the range tend to be earlier kit designs and I never got on with them particularly well unlike the later designs which are masterful. Elsewhere the staff projects showcases my Ruston 165DS model even though it's HO scale and even posed by an American wagon in one photo. Mind you, 4 pages of reviews showing foreign prototypes might cause enough upset amongst the Daily Express reading, "we still have an empire" crowd. Finally, there is a quick review of a magnetic corner clamp. At least I'm in the right modelling genre this time ! Sorry about the lack of post yesterday. Blogger was badly broken and is only now getting back to normal. It's lost all posts made in the last 24 hours, which is going to please a lot of people. 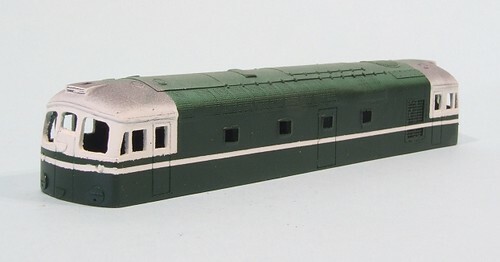 Painting of the Class 26 begins with an all-over coat of white. The grey base coat of primer takes the edge off the glaring colour a little which suits my purposes. Everything still looks OK (the camera is bit cruel in this respect) under the new paint. I'm tempted to say that I'm copying the livery from Lion, but that would be a step too far even for my fantasist tendencies ! 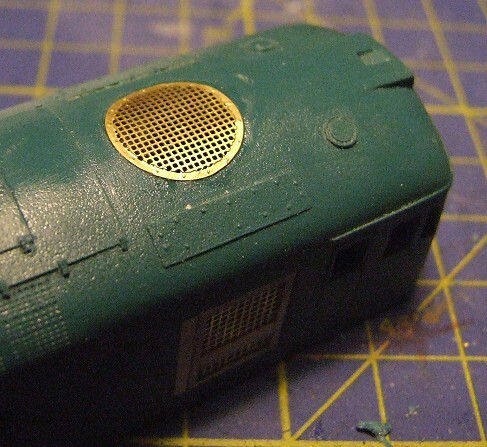 My plan was to mask off the bodyside line and windows, then spray with locomotive green. The grey roof will be hand painted as I can't be bothered to mask again and anyway, it's a colour that looks OK done this way. The waistline is cut from tape at 1mm tall. Probably too wide but as thin as I can manage by hand. Back in the spraybooth, first I tired more white to seal the tape/body interface (how management consultant am I ?) and then on with some Precision loco green. Several light coats were sprayed and dried to get a depth of colour. Then I tentatively removed the tape, and it's not too bad. Perhaps I should have used Tamya tape as some of the edges are a touch more ragged than I'd like but generally, this looks OK. The wobbly bits by the front marker lights can be fixed by hand, they should be below the stripe but if they were, they'd be too low and the stripe has to be there to cross the side grilles at the right point. 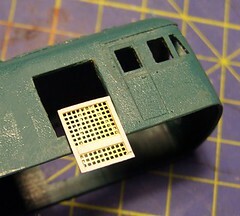 Time for a little nose detail on the Class 26 diesel. The marker lights had been drilled but I hadn't worked out exactly what I was going to do next to finish them off. At first I blanked the backs off with plasticard and though about using filler. Then I had a better idea. 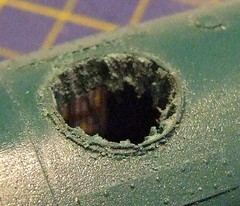 The holes were opened out to accept 2mm diameter rod. This was cut off square at the end and slid in place. The end should finish so it is flush with the side of the hole - the body is curved at this point - so that the end is flat and recessed at one side. A wash of plastic glue inside and the job is done. 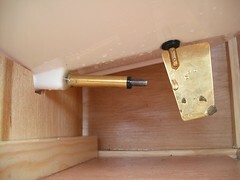 A bit of micro-rod makes a suitable marker light in the housing. The disks are 3.5mm diameter and cut from thin plasticard using a leather punch. Some are cut in half and all are fixed in place with superglue. Best of all the top ones sit over the join where I had to extend the nose door. I'd pretty much hidden this and then I realise I didn't need to do so as the disk does most of the work for me ! After a long absense I'm back in the model boat press with a quick review of a very nice magnetic 90 degree clamp in the June 2011 issue of Model Boats Magazine. I'm quite chuffed with this as the product originally came my way (or at least the advert did and I bought the product) via model railways. 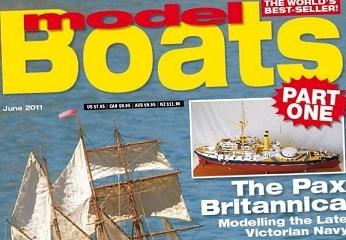 The supplier, EDM Models doesn't do boat stuff at all but then it's always been part of my modelling ethos that there is no reason to have these "chinese walls" between the different branches of the hobby. I know most people see me as a raving oddball for this attitude but that's there problem. Me, I just like making stuff and can't forget a technique just because it isn't railway or boat approved. Of course, this way I do get to do the cross-hobby write ups and make some much needed cash ! 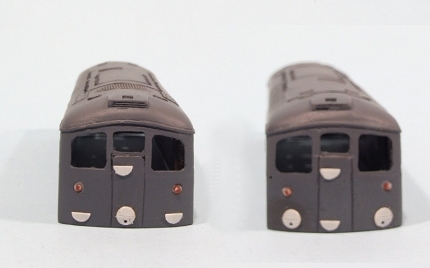 One of the requirements for the C15 was that the cab roof should be removable. I put this to the back of my mind initially as working out how to do this was probably going to involve clips or springs or other stuff that never quite seems to work for me. Once I got to the components though, there was a nice surprise. The kit is designed for this ! Front and back there are vertical plates that slide down the inside faces of the cab and if you carefully mount them far enough out, friction alone will hold the lid in place but allow its removal should the owner want to have a peek in there. The roof itself is easy enough to put together. There are 9 components in the item show including a hidden inner roof that has to be laminated to the top. Even this is well thought out with etched holes that can be filled with flux and solder then hit with the gas torch to get some heat in there. Then watch the solder wick away to join the two bits of metal. The weather has cooled off a bit so to warm things up again, it's time for the soldering iron to come back out. In other words I've been feeling guilty about the lack of progress with the C15 locomotive. Looking at the model, the obvious starting point was to put the bunker back in place - easy enough, it just slots in place and just requires a bit of bending to form the curve towards the top. I bent it around a bit of brass rod and wish the metal had been annealed first. Never mind. Then it was time for the coal rails. 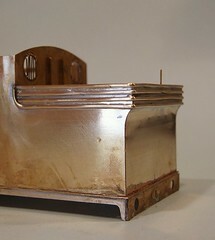 The idea is that some half round brass wire is soldered into the half etched grooves at the top of the bunker. An interesting design but that's prototypes for you. Anyway, the wire fitted nicely and took solder well. I had expected to use the gas torch but the electric iron was man enough for the task. Perhaps its long lay-up has made it keener to put some effort in ! The wire is supplied slightly too long for the box so it has to be straightened. Not easy and I still don't think I've nailed it now. It's a good job this model locomotive isn't to be ex-works as I can claim some damage when the fuel was loaded. An extra length would have been nice. Three are provided and four required. I ended up making up the second rail in from offcuts and leftovers. Had I realised this in advance, I'd have happily (OK, slightly grumpily) paid up for more wire. The key to this job is plenty of flux, not too much solder and then lots of work with the fibreglass burnisher to clean off the excess. There are many readers of those blog who are saying "Blimey, a Beatties bag. I'd forgotten all about them." and others who are wondering what the heck are you showing us a plastic bag for ? Well, you are seeing this because I found it recently and was amazed one was left. It's like a neolithic flint tool in it's historical importance. 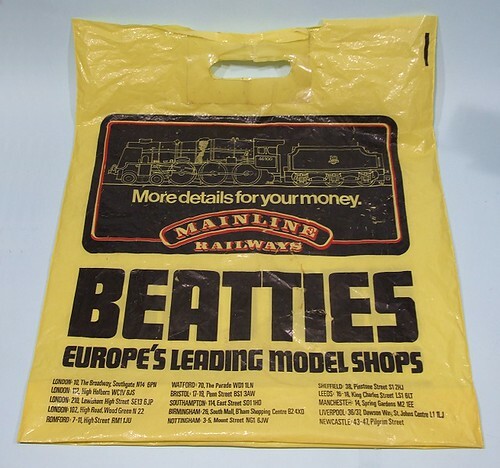 For those who are too young to remember (and shouldn't you be in school or in bed or something by now), Beatties were a national chain of model shops very similar to ModelZone. I best remember the big store in the middle of Birmingham. Like the modern versions, they weren't the greatest model shops in the world for us connoisseurs, but for most people they were fantastic. Bright, well stocked and with lots of toys, kits, slot cars and trains. 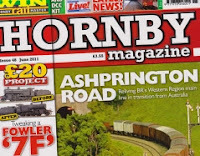 If you wanted Hornby then you were in. Romford wheels - no chance. Talking of Hornby brings me to the sponsor of the bag. 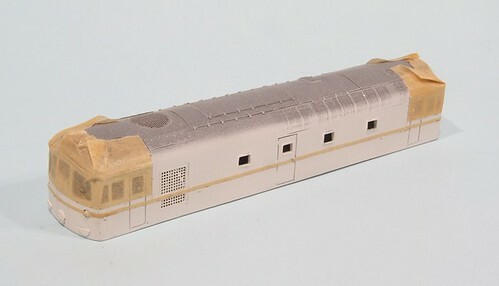 Mainline Railways were one of the first manufacturers to make leaps in the quality and detail of their models. We gasped at wire handrails, separate details and locomotives that looked like the real thing. Someone else can explain the complex intertwining of the histories of Mainline, Palitoy (who owned them I think), Airfix model railways and now Replica and Bachmann. What I remember is that were impressed with the models even though they could still stand a bit of extra detailing. All this makes me feel nostalgic for the 1980's. Where's my Miami Vice DVD ? More on the store in the Wikipedia entry - who knew they had an e-commerce website at the turn of the century ? Wow ! 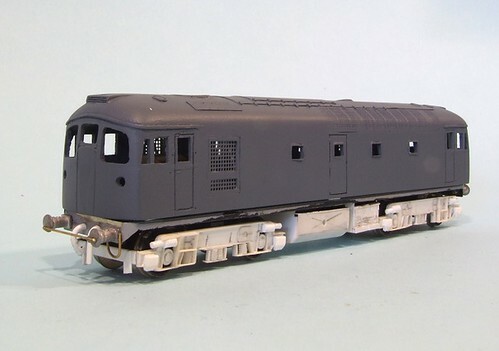 After all the grille work, I had a fair bit of filling to do, especially on the sides of the Class 26 model. As I've mentioned before, the only way you can see what needs doing is to get the body into a single colour. Some might say I am a little premature with this as there is still work to do on the nose, but I'd argue that this is simply sticking disks on and if I needed to do any more filling and filing, it's easier without extraneous detail in the way. A quick blast of Modelmates grey primer later, I had my answer. So I shoved some more green modelling putty in all the holes that had magically appeared and left the model to dry for a few hours. After this a few minute attention with a big flat file (don't use a needle file for this) and emery board followed by another shot of primer and I think I'm as near there as I'll get. The loco still isn't perfect under the cruel eye of the camera but it's reasonable to the human eye. My locos are best described as "layout locos" after all since they are intended to be seen in the context of a bigger scene so while I'll do my best I try not to lose sleep over it. To my mind a reasonable model on the tracks is better than a perfect one that never gets completed. How thick is your bodyshell ? First up I drilled a load of holes in the moulding. Then I tried to join them up by waggling a knife blade in these to join them up. This didn't seem to work so I dug out the piercing saw and used this. One removed, the plug of waste turned out to be 4.5mm thick ! A quick clean up with a file and then the big tapered reamer sorted the inside. I pared away the top detail with a sharp knife. Finally the etched part was stuck in place. It looks a lit better and even comes with a little fan that I might paint up and fit at a later date. With the Class 26 grilles made, they had to be fitted into the locomotive sides. I'd already made the holes, filling them up with mash should be easy. Except it wasn't once I started measuring. There are a couple of "issues". The first is that Class 33 grilles are larger than Class 26 ones. Not much buit a little narrower, enough to be visible if you know what you are looking for. Second, the original body shell was less accurate than I expected. The grille, and therefore the hole I made, was a couple of mm longer on one side than the other. As you can see from the picture, the new grille would fall straight though ! The solution I decided on was to square up the hole properly and stick the front edge of the new grille in place. This seemed to be spot on for the position I required. Along the back edge a strip of 2mm plstic was fixed in place. I left this proud of the surface and once everything was dry, filed and sanded it back. Hopefully this will hide the repair although I won't know that until the primer is applied. The Class 26 diesel project has stalled slightly while I pondered the construction of the grille in the side of this 3mm scale model locomotive. In 4mm, replacement of these is simple - cut old grilles out, removed etched replacements from packet, glue in place. I don't have that opportunity. Lots of etched parts for the larger scale were examined and the only ones I found that looked like they might nearly do the job were still not close enough. That and at a fiver a side, they were more than I wished to pay for something that wasn't right. 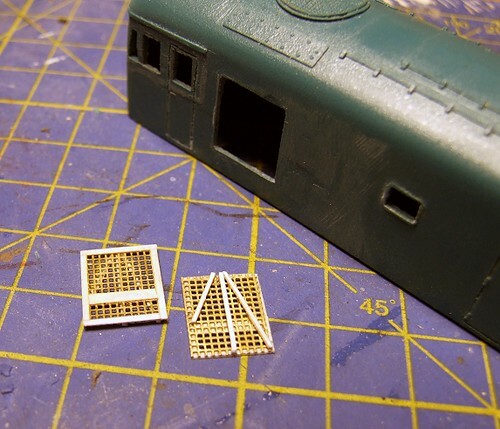 So, I picked some cheap Class 73 grilles up with a view to using them for material. If I hadn't been so impetuous I might have waited until York and grabbed a pack of random grilles from the A1 models stand for less than the pair I bought, but then hindsight is a wonderful thing. Anyway, option 1 was to make some frames up from thin plastic, and glue the etch to this. I gut the outside of the frames and then decided to abandon them since the metal part was stronger than the plastic that was supposed to be supporting it ! Starting again, the etches were cut with scissors to reduce them to size. Then a thin frame of microstrip stuck to the outside with superglue. On the reverse, more microstrip made a representation of the framing clearly seen on the real locomotive. Once dry, everything was filed to finish the job including a good sanding on the front to thin down the plastic as much as I dared. As part of the developments to the model boat club, the benches were modified. We have half a dozen of these dotted around the clubhouse for members to get their boats ready for the water. Designed as picnic benches, the sort of thing you see in beauty spots or pub car parks, they originally had bench seating incorporated along the sides. This has now been removed as it gets in the way of the boat prep - bashing knees to no good effect. The net result being several lengths of the decking wood they are made from being available. 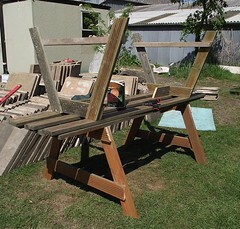 Enough as it turned out for Rob and myself to make up two more benches to augment the stock. This is a good thing. Aside from making good use of the wood, we need more benches. With 60 members and at two members a bench you can guess how many we'd need if everyone turned up at once ! Even on a Thursday morning all the space can be occupied so once those who have to work for a living turn up, there is a squash. The photo pretty much shows the constructional details. You need a couple of lengths of wood to make the legs and brace plus 3 or 4 for the top - we leave gaps between the planks so boat hulls sit nicely if the model doesn't have a stand. Construction requires a saw, tape measure, pencil and an electric screwdriver. Decking nails throughout and then a coat of wood preservative. Time taken for two people, around half an hour. While you lot were all cooing over The Dress at The Wedding on Friday, some of use were outside taking part in some good honest toil. Never let it be said model making hobbies are sedentary. A group of Knightcote Model Boat Club members were hard at work shifting paving slabs and clearing the ground for the final stages of our new clubhouse development. 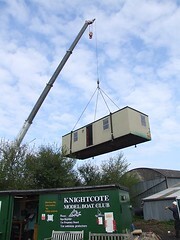 The plan was for a new clubhouse, which you might recognise as a second hand building site office, to be installed behind the existing facilities. These would then be split in half and one would head off to the local model car club for their use. The other would be spun around at an angle to the new premises and act as a storage unit. That way not only do we have larger clubrooms, all the "stuff" that we have such as mowers, tables, chairs etc, doesn't have to live in the main building. Thanks to a hired crane, our new building flew in over the hedge and landed on the concrete pads we'd put in to support it as well as the 10 tons of road scrapings underneath it. We hired a digger to move most of those for us ! The old clubhouse, which was two shipping containers, was lifted with a bit of effort by the farmers Manitu. It wasn't quite so easy as the main building to shift but a bit of maneuvering and hasty shoving blocks under the corners has given us storage that's pretty level and just needs the end filling in to finish the job. 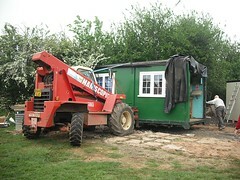 Now all we have to do is lay an enormous patio and we can go back to sailing boats rather than playing Bob the Builder ! Apparently we are all supposed to run outside and do stuff in the open air. In theory that means gardening but around here it mostly seems to be visiting garden centres, DIY sheds and while we are on the retail park, we'll go to Tesco and look, there is a new Cafe Nero and a big branch of Next, well go and have an ice cream from the van in the middle of the car park. Basically, we aren't supposed to play trains. Last weeks York show certainly took a hit in numbers thanks to being held on a cracking bank holiday weekend. Go to see the trains ? Certainly not, it's far too nice.